KEARNY, New Jersey (WABC) -- A woman walked into a pet store in New Jersey and walked out with an adorable puppy, without paying. The theft was caught on camera. "She came here when my dad was with another customer, and my dad went in the back to get another dog for the customer, and she opened this up, took out the dog, and ran off," said Maria Duarte, the store owner's daughter. This type of puppy love, well there's nothing good about it. 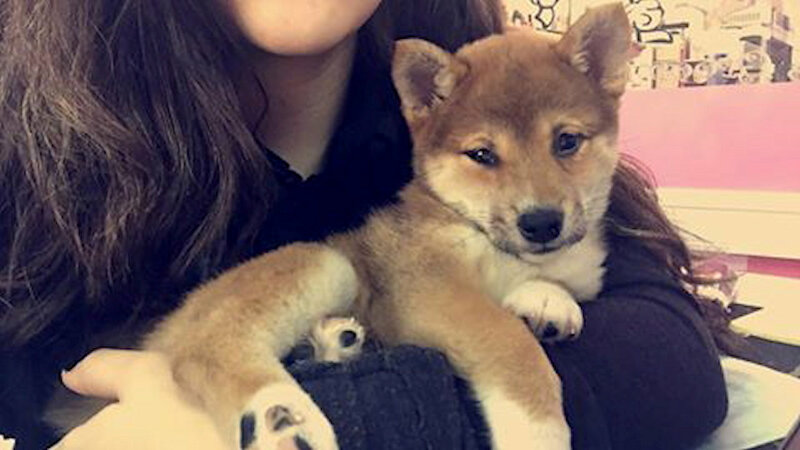 A 12-week-old Shiba Inu was snatched right out in the open. "I found it very disrespectful how she just came in here and thought she could just get away with it," Duarte said. Of course, the 1,200 purebred had been on proud display in the front window of "Oh My Dog" in Kearny. Her unofficial name is "Brownie". Fortunately, Brownie was found Thursday around 10 p.m. Two teenagers saw the puppy wandering around by itself outside of the Rite Aide on Kearny Avenue. That's about two blocks from the pet shop. Both of the kids recognized the dog as missing and took it inside to the store clerk. The store clerk then called the pet store owner because she too knew that the dog had been stolen. So the dog is now back in the possession of the pet store owner and police have been notified that the dog has been retrieved. Still images from the store's surveillance system are all Kearney police have to work with for now when it comes to identifying the suspect. But, they're also checking cameras from nearby stores to see if there is any other video of the suspect.